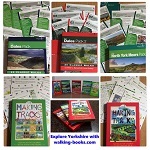 walking-books.com are thrilled to have had our unique range of walking guides to Yorkshire recommended by our friends at Gorgeous Cottages and we are both sure that, if you are staying in any of their 150 wonderful cottages, your stay will be enhanced with our walking guides to the Yorkshire Dales or North York Moors. One of the top reasons to visit Yorkshire has got to be the wide selection of stunning walks available in the two National Parks that the county has. The Yorkshire Dales includes some of the finest limestone scenery in the UK, from crags and pavements to an underground labyrinth of caves with each valley or 'dale' having its own distinct character, set against expansive heather moorland tops. Stone-built villages sit amongst traditional farming landscapes of field barns, drystone walls and flower-rich hay meadows. We also think the North York Moors is all pretty fabulous – from low dale to high moor, and shady forest to dramatic coast. So many sights, towns and villages, views and experiences that we really wouldn't want you to miss on your visit to the area. Our unique walking guides to Yorkshire will help you make the most of your visit and, whether you enjoy short strolls or longer and more challenging hikes, there is something for every member of the family....including the children who have there own range of guides called Making Tracks. If you love Yorkshire....you'll love our walking guides! The Ultimate Walking Companion to the Yorkshire Dales - 20 classic walks on individual, handy, weather-proof cards with OS mapping. Following on from the succcess of our original Dales Pack this second volume offers a further 20 inspiring Dales walks on individual, handy, weather-proof cards with OS mapping. The Ultimate Walking Companion to the Yorkshire Dales. These beautifully hand-illustrated packs each contain 10 easy-to-follow short walks and have proved a huge hit, especially with families and with schools organising outings and day trips. If you are looking for a varied, exhilarating selection of walks in this beautiful area of the country then our North York Moors Pack fits the bill perfectly. 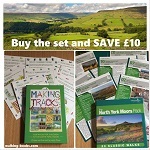 This is the fourth volume in Joanne's hugely successful 'Making Tracks' series and is an excellent way of introducing your children to the wonderful North York Moors. SAVE £10 with this SPECIAL OFFER that includes both the North York Moors Pack and Making Tracks in the North York Moors - no better way to explore 30 of the best walks the North York Moors has to offer. 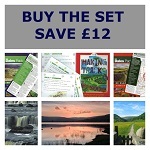 SAVE £12 and get FREE delivery on this fabulous set of 3 unique walking guides to the Yorkshire Dales. FIFTY varied walks to suit all the family. Explore Yorkshire with the ultimate walking companions! A total of EIGHTY TWO walks to suit all abilities. RRP is £68.75 - SAVE £25 with this fabulous offer!